Last Friday we gathered at Chow’s place to cook dinner. The menu: homemade pizzas and pasta. 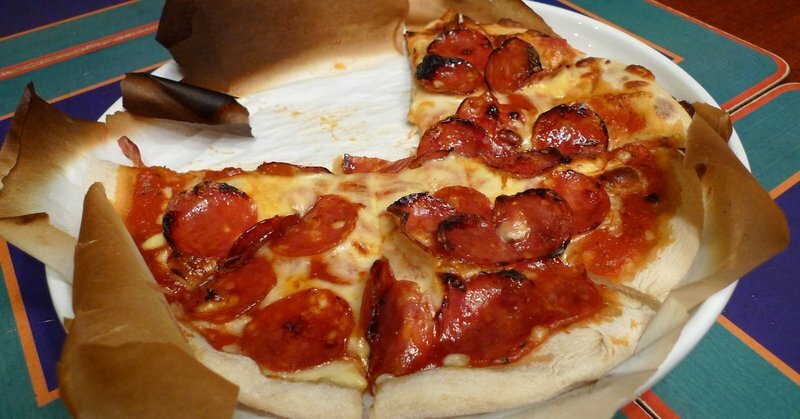 The pizzas were a variety of gourmet types based on the menu of Roberta’s Pizza in Brooklyn, which Chow had tried on a recent visit. The pasta was a homemade chorizo and butternut squash ravioli. And to top it off, I made kaffir lime cheesecake. Friends gather around the large island in the kitchen, helping to prepare ingredients and eat appetizers. The ravioli are already prepared and drying and we were waiting for the oven to preheat for the pizzas. 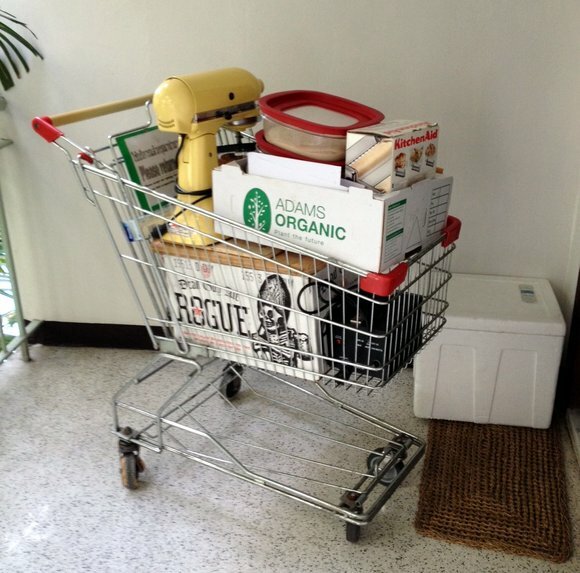 Every time I cook at a friend’s house, it is a bit of a logistics ordeal. In this case, I needed my KitchenAid mixer so I could roll out the pasta. I was also bringing a case of Oregon beer. The beer in question is from Rogue, an independent brewer. 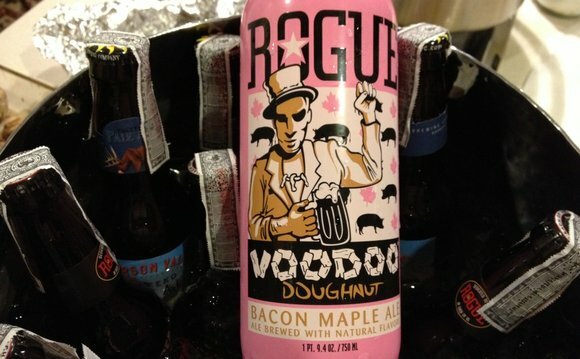 The most interest beer of the evening: Voodoo Doughnut Bacon Maple Ale. Had a distinct smokiness with a subtle sweetness on the tail end of the flavor. For the pasta, I made homemade fresh (not dried) chorizo. I bought pork belly and ground it, adding paprika, garlic, and chili powder. Browned the sausage in a pan, drained it on paper towels to remove the considerable grease, and then blended it with a butternut squash puree made from locally produced organic squash. Make the pasta from scratch using Thomas Keller’s “Seven Yolk Pasta” with semolina flour. This is the best way to mix pasta dough, using your hands. Using a creative technique I picked up watching Season 10 of Top Chef, I layered sage leaves between two sheets of pasta dough and then pressed them several more times. Then flattens the leaves, making the pasta pretty and adding some sage flavor. Completed ravioli. I cut them relatively small so they didn’t have a lot of filling. In hindsight, I would have added more butternut squash and less chorizo as the sausage overpowered the squash flavor. A few more sage leaves would have been nice, too. After boiling the ravioli, we fried them in a pan with browned butter and sage leaves. Became a bit more crispy than intended but were tasty all the same. While I made the pizza dough (with Type 00 flour, a finer texture than regular all-purpose flour), I let Chow coordinate the toppings for each pie. Half mushroom and pepperoni and half Jerusalem artichoke and pesto. Sliced Brussels sprouts, Boursin cheese, and locally produced pastrami. Tomato, fresh buffalo mozzarella, and rocket. 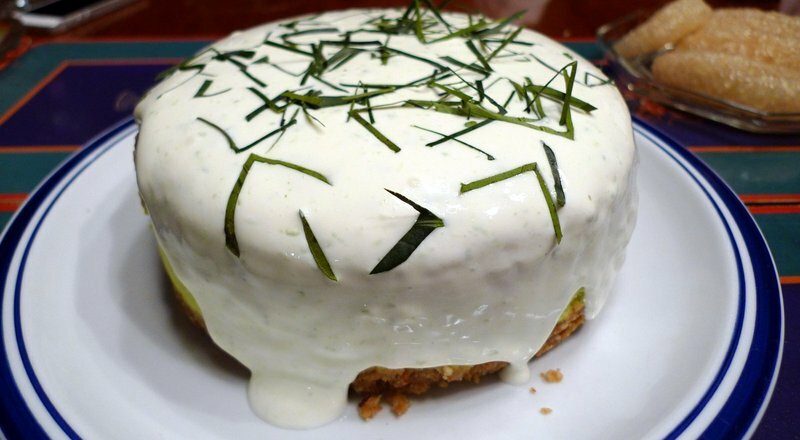 For dessert, I once again made the kaffir lime cheesecake that was such a hit on New Year’s Day. 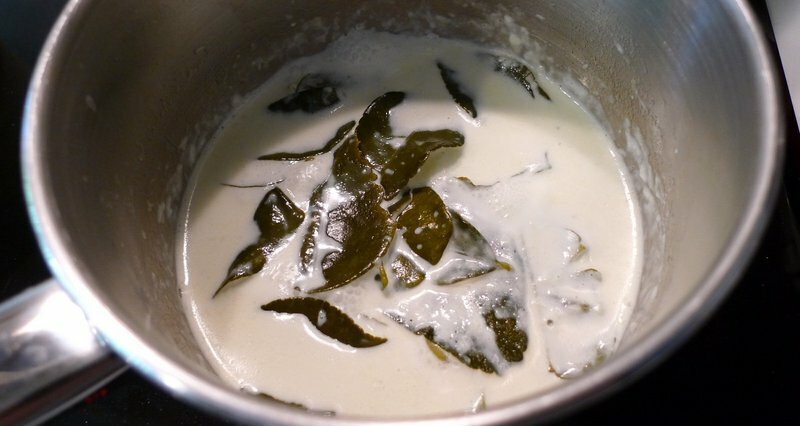 It begins by steeping the lime leaves in heavy cream. The crust is made of graham crackers, toasted pecans, sugar, and butter. 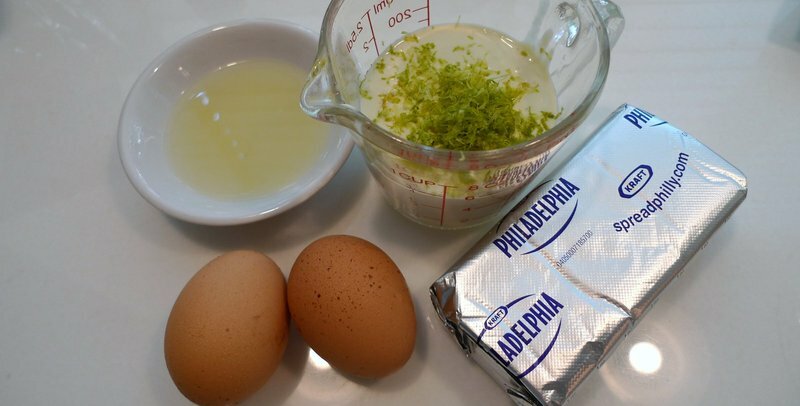 The main ingredients are cream cheese, eggs, the infused cream, kaffir lime zest, and a little lime juice. The juice comes from a regular lime as the kaffir lime juice is much to acidic. The ingredients are blended together until smooth and light. Truth be told, I add two or three drops of green food coloring just to augment the color. The leaves alone give it only the most pale of greens. Tap several times to release air bubbles and then cook in a water bath for 40-45 minutes. The key to a cheesecake with a smooth top (no cracks) is to turn the oven off when the edges are set but the center is still very shaky. Then let it complete cooking in the closed (but turned off) oven for another hour. This lets it cool down gradually and prevents the cracks. The finished product has a mixture of sour cream, kaffir lime zest, and sugar poured over the top. I garnished with a chiffonade of kaffir lime leaves. This worked okay the first time but this time the leaves were a bit tough. I need to choose the smaller, more tender leaves and cut them more finely. The taste of the cake was good, though, and won rave reviews. Most importantly, we had friends gathered together and shared good food, good wine, and good company. After all, that’s what makes the best meals, right? The company with which they are shared. This entry was posted in Uncategorized and tagged cake, chorizo, cooking, food, friends, pasta, pizza, ravioli by christao408. Bookmark the permalink. ah, nothing better than Italian! We have a bottle of that same Rogue beer in our fridge too! I love seeing your food posts, so inspirational. Wow, all the food looks amazing! Cooking parties are fun, I wish I had more friends who appreciated cooking. If you were in my ‘hood; I would conveniently drop by around dinner time. I’m there. Simply share with me the date and time of the next one. Ah good filling Italian food with good friends – yummy. I prefer some nice wine – northern Italian. I still don’t get how everyone around you isn’t 300 lbs. and i was just about to go to burger king, thinking i would have a great meal! I’m going to have to try to make Brussels sprout pizza! It looks so good!!! @I_love_Burma – @Foodhog – Thank you both for the recommendation. 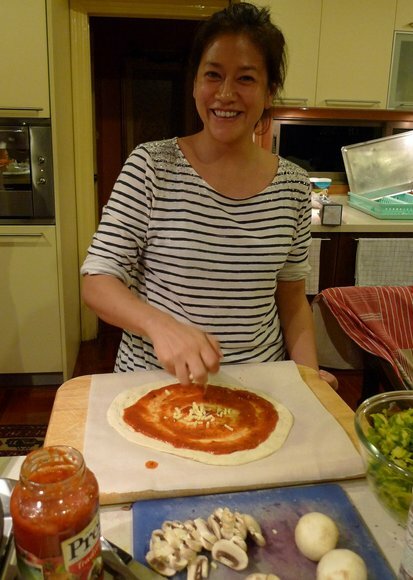 @murisopsis – Pizza is a great platform for vegetables and can be really healthy that way. @Composing_Life – You might have a good meal at BK, but definitely not a great one! @LostSock21 – We get so tired taking pictures of the food that we forget to eat it. LOL@DoRi_dOrI – @armnatmom – So glad you enjoyed the pictures. @Fatcat723 – Yes, I’m generally not a beer drinker but on this occasion, it seemed right. 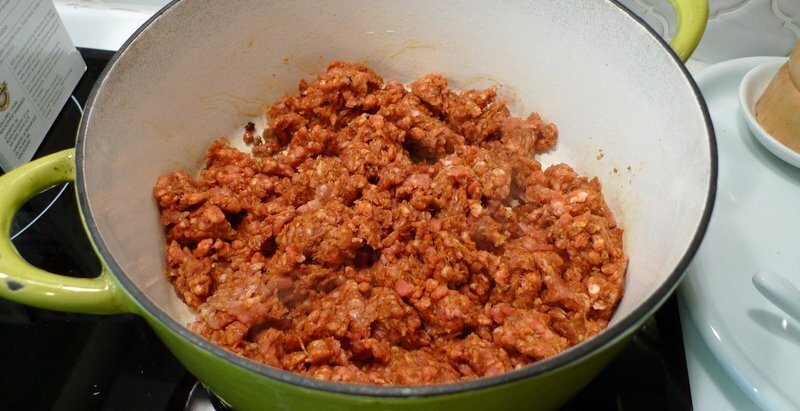 @nov_way – I suppose you could make chorizo with beef although its authenticity would be called into question, much in the same way that the pork pastrami I find sometimes here in Thailand just seems… wrong. =)@theartofsexy – @ElusiveWords – Everyone talks a good game but when is the airplane ticket to Thailand being booked? Ha ha ha…@babybug329 – I tell you, I’ve really refined my group of friends so that it pretty much includes only people who at least appreciate good food, even if they aren’t into cooking. @AppsScraps – It really is quite the rage these days. Will have to return to Portland and find out what these Voodoo Doughnuts are all about. I would totally try the thing with the leaves, but with basil instead of sage. Sage is a very potent herb to me, and tends to overpower things. What a wonderful time together-friends cooking and eating together, and enjoying each others company.You, my friend, are not just an excellent cook, but you know how to live. Oh, my heavens. It looks to be such a good time for you all. Good company and good food, what’s better than that? I still make homemade noodles myself. The thought of purchasing a bag of noodles at the grocery makes me cringe! Sage in the pasta sounds like a good idea! I wish I could crash the party and eat up! Oh, dear Lord, Christ!Who the hell can eat all of those???? Are there 30 people in the house? LOLOh, the pizzas looks damn good! I do pizza but I always do it square – easier and bigger size.Ravioli is so Italian! I love the one with meat inside and my kids love it with cream sauce.Great cake there too! Yummy! Kaffir lime cheesecake. Your signature dessert? ok, i want that try that beer. sounds so interesting. that safe ravioli also looks delish. along with the Brussels sprouts, Boursin cheese, pastrami pizza. but if there is only one thing i can choose from them selections, it would have to be your kaffir lime cheesecake. there’s just no contest. @ihavekp – Thanks@angelwingfive – Yes, sage can be overpowering. In this case, it really was such a small amount that amidst the filling, sauce, etc. you tasted only a subtle sage flavor. Any “soft” leaf herb works fine, though. 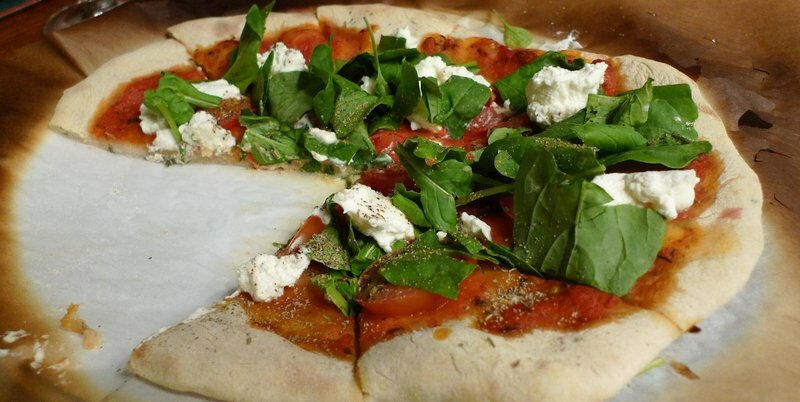 If you use larger basil leaves, just be sure to cut the stem off, otherwise it will tear the dough. @Grannys_Place – Somewhere from that French side of my family, five or six generations ago (or more! ), I have retained that joie de vivre. @TheBlondNextDoor – I should make pasta more frequently. It isn’t that much effort and the results are miles better than dried noodles. 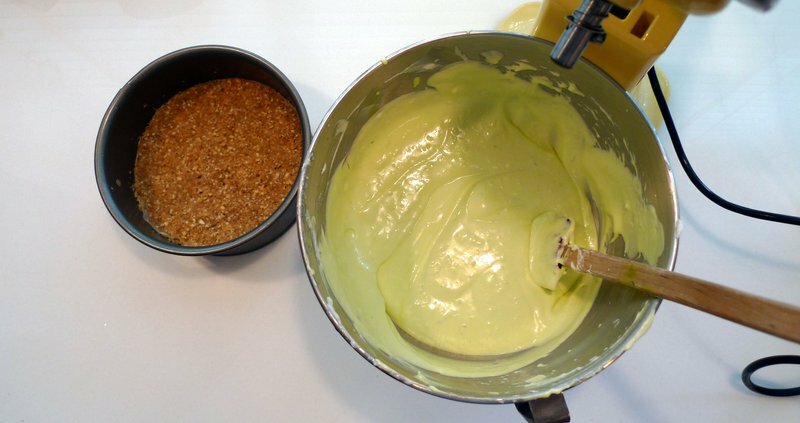 @grannykaren – That’s how I used the rest of the puree, in fact. Turned into a very satisfying soup with some homemade chicken stock and a bit of cumin for a slightly “exotic” flavor. @CurryPuffy – You know where to find me. =P@Sherrie_de_Valeria – Enough food for 30 but only a third of that many people there! @Inciteful – If I can refine it with a little more practice, it may indeed become my signature. @rudyhou – Request it next time you are here. @Toro69 – @Toro69 – Thanks! @ihavekp – Your blog looks like it hasn’t been updated in a while!